Most managers see organizations as machines, of which the cogs should turn as smoothly as possible. This picture isn’t entirely wrong, since many people like a feeling of flow. However, it can also lead to excesses such as time clocks, bureaucracy, and demotivated people that cannot do what they feel is good. Therefore it is a trend to give the employees increasingly more responsibility. For example, in Lean, often only strategic targets are set. When you continue on this course, you might raise the question: Do workers actually need targets and bosses, or can they also manage themselves? Can a company be organized like a swarm of birds, that freely can move in any direction? Such an organization would act like a soccer team. The players sense what is needed, and with their collective intelligence they steer the company in the right direction. Frederic Laloux not only thinks this is possible, it is already happening! In his book “Reinventing Organizations” he studied 12 organizations that rely to a large extent on self-management, Examples are the Dutch neighborhood nursing organization 'Buurtzorg', the French brass foundry FAVI and the American tomato-processing company Morning Star. In such an Evolutionary-Teal Organization, everybody can be a co-entrepreneur. Multinationals like Philips often say that this is what they want. However, a paradigm shift is needed to achieve this, says Laloux. Top-down management, based on fear and control, must be replaced by self-management based on trust and giving meaning. Simultaneously, extrinsic motivators like money and status are replaced by intrinsic motivators. The employees can now do what they feel is right for the society. According to Laloux this generates so much energy, that profit naturally follows. 'Democratic' organisations are not chaotic. The self-managing teams are coached. Besides that those teams apply standard tools for among others (1) conflict resolution, (2) mediation by colleagues, (3) giving feedback and (4) organizing solution-driven meetings. These tools can be compared with the rules of soccer. Penguins are funny because of the awkward way they walk. However, in the water they transform into fast and agile swimmers. Could it be that a lot of people at work are restrained like penguins on land? And if so, what re-organization is needed ? This is the question that Frederic Laloux answers in his provoking book “reinventing organizations”! Einstein stated that “no problem can be solved from the same level of consciousness that created it”. According to Laloux, we are more or less prisoners of our view of the world. That also limits the way we think about organizations. Through the ages, the way we think people should interact to achieve things together gradually changed. In one direction: increasingly more freedom. Laloux reviews the literature about this, with an interesting new focus: What did this mean for the way companies are organized. Humans first lived in family kinships. Next, tribes were formed, and later chiefdoms. After this, the first organizational model originated, and the nations based on it. Laloux uses combinations of colors and names to indicate organizational models. In the Amber-Conformist view, authority is linked to a role (like a police officer). There is one accepted right way of to do things, conforming is neccessary. Some organizations, like many government institutions and schools, still see the world through ‘amber’ glasses. Thinking and doing are strictly separated. The underlying belief is that employees tend to be lazy and dishonest, and should be kept in line. Their clothes reflect their rank, they wear a social mask. The next organizational model is Achievement-Orange. Now, the focus shifts from conforming to achieving: the keywords are ‘winning’ and ‘competition’! This is the model of most organizations today. The view on human behavior remains rather negative: people need to be pushed and controlled. However, the amount of freedom already increases. It is attempted to make use of all the professional knowledge and problem-solving power in the organization. This is done by management by objectives or Hoshin Kanri. Workers start to improve their own processes by studying cause and effect. That way, the border between thinkers and doers fades, be it that managers still keep the exclusive right to formulate the strategy. However, everybody can climb the organizational ladder and become a ‘winner’. An organization is seen as a machine, of which the output (profit) can and should be steadily increased, describes Laloux. And when the cogs (the people) get stuck, a soft intervention like injecting oil will solve each problem. An Achievement-Orange organization can rather easily become disconnected from its purpose. This will make the employees feel empty and soulless. The first resistance against this occurred during the flower power period. Culture-driven organizations like Ben & Jerry’s seemed to be the answer. These operate from a Pluralistic-Green (social responsible) organizational model, which sees companies as big families with servant leaders. Achievement-Orange and Pluralistic-Green gave the workers much more freedom than Amber-Conformist. However, they still are not as free, agile and energetic as penguins in the water. If you want that, a transition to a complete new organizational model is needed, Evolutionary-Teal. The plea of Laloux for that is extreme but convincing. Indeed, the rise of organizations that have at least a number of Teal or blue-green characteristics can be seen in many recent articles on this website. Companies strive for more freedom, more meaning, more joy and more self-management at work, and want to operate with less harm to the environment. Subtitle: A guide to creating organizations inspired by the next stage of human consciousness. By: Frederic Laloux. He works as an adviser, researcher and coach, and supports corporate leaders who want to explore the possibilities of Teal operation. 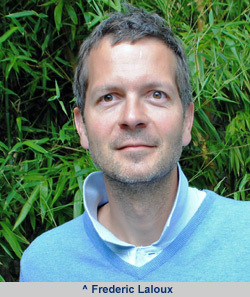 Laloux lives in Belgium. Published by: Nelson Parker, 361 pages, 2014. ++ The lion’s share of the book describes self-management practices in existing organizations. + The subject is very topical: many companies want to grant their employees as much freedom as possible, so that they optimally can use their competences and problem-solving capabilities. In addition, the employees can then behave more like entrepreneurs. +- The book is very thick. I would recommend Laloux to make a short version for busy managers and CEO’s. - Some parts might give you the impression that the book is a plea for spiritual enlightenment. On the website www.reinventingorganizations.com you can buy this book. Or you can download it there. This is even possible for free, in that case you pay what feels right later, in accordance with Teal thinking! All organizational models before Evolutionary-Teal are in essence based on fear. Fear that people do not work hard, act irresponsible, and put their own interest ahead. To cope with this, a lot of control instruments are developed by managers. However, the resulting atmosphere of fear and control can demotivate people. It alienates them from the purpose of their work, and it inhibits them to do the right things. Evolutionary-Teal organizations therefore operate from a totally different view: people are in principle good, trustworthy, and capable of making good decisions. When you view people with mistrust, the people will try to mislead the control systems. The more trust you give, the more responsibility people will take. You reap what you sow, says Laloux. Trust and even love (!) makes it possible for people to reach their full potential. The feeling that they can add something good to this world makes them feel energetic. 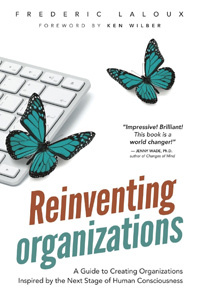 Laloux researched twelve organizations as examples of these new Evolutionary-Teal organizations, operating in very different sectors, for-profit and nonprofit. 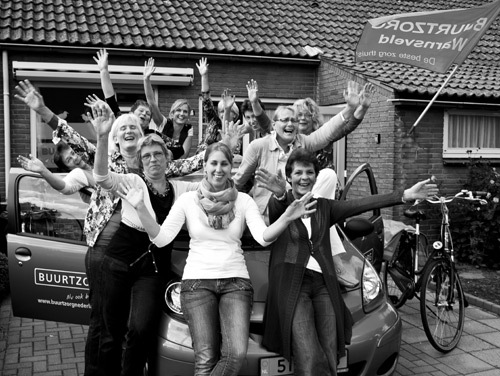 One example is 'Buurtzorg', a neighborhood nursing organization in the Netherlands. Another one is FAVI, a brass foundry in France. It produces among others gear forks for the auto-industry. A third one is Morning Star, a large tomato-processing industry in the US. An example I was missing is Semco, a Brazilian organization which is well-known because of its radical-democratic way of operating. Laloux also gives a masterly example of trust himself: at his website you can download his book, and pay for it 'what feels good' later. Neighborhood nursing organization 'Buurtzorg' is an example of a Teal-organization, operating almost completely with self-managing teams. On the picture an enthousiastic team in Warnsveld, The Netherlands. There are a lot of similarities in the way the Teal-pioneers are organized. This makes it possible to develop a blueprint. Whereas Achievement-Orange looks at an organization as a machine, Evolutionary-Teal sees it as a living organism. It is a self-organizing system of cells (the people), without a central command system. Just like animals adapted during the evolution, an Evolutionary-Teal organization continuously adapts itself, based on stimuli from the business environment. This organizational form exceeds a democracy, it is a holacracy: everyone’s voice is heard and everyone can lead.